We're so excited to share with you the official list of the amazing group of designers joining us for our 2nd Anniversary Edition on May 6 - 20, 2017. The theme for this edition is DESTINATION: EUROPE where each designer got to choose their prefer city as inspiration. Also, some of our participants will offer gifts to celebrate with us and to reward our customers for their loyalty and support. 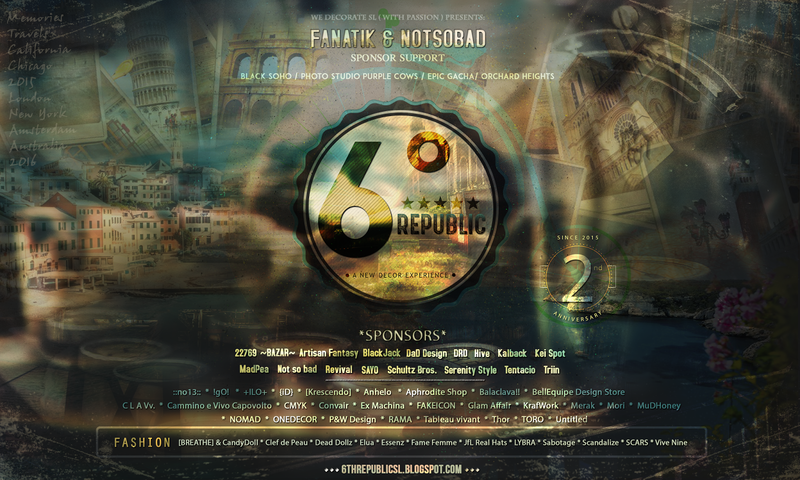 For this Anniversary Edition of 6 Republic, we decided to incorporate some of SecondLife's incredible fashion designers. This talented group of designers were excited to create some amazing European styled trends to complete the travel experience for our customers. Be sure to check them out and add these awesome creations to your wardrobe. Early Access OPENED at 10 am SLT on May 5th.